» Who Were Involved in WW2? Who Were Involved in WW2? In terms of nationality, five major countries participated in WW2. 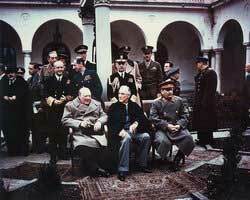 Russia and the Soviet Union, led by General Secretary Joseph Stalin, held different positions during the war. In Asia, Russia and the Soviet Union had a series of clashes with the Japanese, had a period of uneasy peace between 1941 and 1945, and then tore up the non-aggression agreement to surprise attack Japan in the final days of the war. In Europe, they invaded Poland jointly with Germany, and then joined the Allies when Germany turned on them. There are also many other countries involved in the war. For example, led by Chairman of the Nationalist Government Chiang Kaishek, the Republic of China played a critical role in tying down many Japanese Army troops, making them unavailable to defend against the American advances in the Pacific War. Italy, too, played an important role in the political arena before the start of the European War and with her actions in North Africa and the Mediterranean Sea. Poland, France, Ukraine, and other European nations suffered greatly as much of the European War was fought on their soil. Last but not least, Commonwealth nations such as Australia and Canada devoted much of their resources for the Allied cause. Where did both of the wars take place and Who was involved in them? I love history, especially ww2! I was wondering why did the United States want to stay out of the war at first? Anyone know. im stck at school doing this project so plz help me do this projct help!!!!!!!!!!!!! I'm doing a project about what was going through the head of a hawk during WW 2 . Help ? the was alot more people involved than this no help at all. There are so many five-year-olds commenting as anonymous. Are you retarded or something? who was involved? what did they do? When? Why? How many allies were killed? How many Germany soldiers were injured and killed in WW2? how many people were killed by the holocaust 9 this isn't only Jewish people)? Where did it take place and who went to fight we need more information people. This is good, but I still need one of the people who was involved, like Scott Joblin, or John Tower. Was Scott Joblin involved? What about John Tower? We need MORE!! Please give more information on who was involved, but otherwise, great work! Good grief kids..... if you want to know about WW2, Google the *** thing. Not that hard....it was a horrific war. DIDN'T HELP ME. . .